Why do you write children’s books? It’s pretty clear Barbara Rosenstock does because she loves history and people. Two perfect interests for someone who writes picture book biographies. Whether writing about historical figures from the past or modern figures from more recent times, Rosenstock brings the stories of her characters to life for her young audience through her writing. She’s a multiple award winning author. Her book, The Noisy Paint Box, with illustrator Mary GrandPré, is a 2015 Caldecott Honor book. Narrative nonfiction uses a classic plot structure and storytelling techniques - a beginning, middle and end; a story arc, scenes, dialogue - all based on accurate, verifiable evidence. It is possible to use creative storytelling to tell a true story. Historical fiction uses the author’s imagination to invent or reinvent characters, scenes and dialogue to tell a fictional story based on real people, a true event or time period. 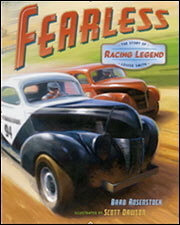 In Fearless: The Story of Racing Legend Louise Smith, Rosenstock brings to readers a little known part of American race car history, the story of the first competitive female race car driver. Rev up your engines! This story is action packed and inspirational for free spirited, daring girls who follow their dreams. The Noisy Paint Box is the story of the Russian abstract artist Vasya Kandinsky. The events are true, but the dialogue is imagined by the author. It paints a story with words that speak to our senses. 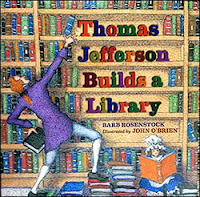 In 1814 the British burned the Washington D.C. capitol and Thomas Jefferson’s books from his personal library rebuilt the Library of Congress. 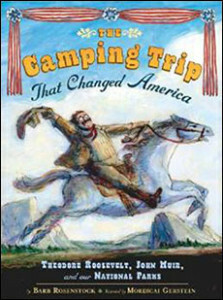 President Teddy Roosevelt left Washington D. C. to go camping in Yosemite with California naturalist John Muir. That trip inspired the campaign to protect and preserve the nation’s wilderness through the establishment of our National Parks. In one interview, Rosenstock talks about the struggle to find the focus of her story about Dorothea Lange. Although she felt Dorothea was an interesting character, she couldn’t find the hook for kids. Then she listened to an interview where Lange talked about ‘seeing’ and it clicked. See Barbara Rosenstock’ s YouTube Channel book trailers for more about how she hooks readers so they long to learn more about the people she writes about. Picture book biographies are typically written as birth to death stories or are focused on a key event in the subject’s life. 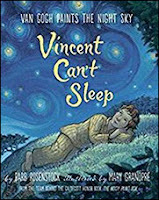 In Vincent Can’t Sleep, Rosenstock used lyrical language and imagery, to tell the life story of Vincent Van Gogh and his insomnia to show how he created his art. 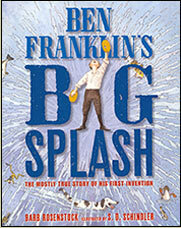 Ben Franklin’s Big Splash: The Mostly True Story of His First Invention is the fictionalized story of a young Benjamin Franklin. His curiosity about why fish swim better than humans led to Ben's first invention, fins. That experience inspired a lifelong passion in Franklin. Back matter differs from book to book and adds in-depth historically and or culturally relevant context to a story. It allows writers to include interesting information important to a person’s life that doesn’t fit in the narrative arc of a 32 or 40 page book. The extensive back matter in Streak: How Joe DiMaggioBecame America’s Hero, takes up all 4 pages on 2 spreads. It includes an author’s note, statistics, source notes for quotations, newspaper headlines, a bibliography, articles, websites, and additional sources and acknowledgments. The amount of information provided is a testament to the exhaustive research Rosenstock conducted to write this story. 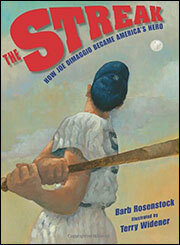 Barbara Rosenstock's books are a must read for anyone interested in writing a picture book biography.
! She was born on April Fools’ Day. and 6 was just plain mean and nasty.
! She’s published with Mary GrandPré, illustrator of the Harry Potter books.
! She likes animals, has two poodles and hundreds of poodle figurines.
! She worked in advertising and education before becoming a writer. Great summary of Barbara's works! Thanks, Keila! Wow , I have read most of Barb's works, but now I want to do an entire detailed study. Masterful post that brings out the keys to writing the best PB bio. Thank you, Keila. Keila, this is brilliant! Thank you so much for showing us the difference between historical fiction and narrative non-fiction while writing biographies. Thanks so much Traci! So fortunate to have a writer like Barbara Rosenstock writing PB biographies. I'm waiting for Vincent Can't Sleep--it has been in my library queue for so long. I LOVED Dorothea's eyes--such a lovely book!! 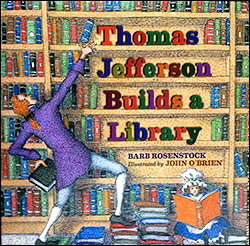 And both the Jefferson & Roosevelt books were wonderful too! Vincent Can't Sleep is brilliant Maria. Barbara talks about how she got the idea to focus this story on Vincent's insomnia. An illustrator mention to her staying up late to work and bingo, it clicked. Plus, Barb is a good person...generous with her talents and wants to help others succeed. Great survey of her stellar books! I must find her on social media to share it. Paying it forward! Love this post. It makes me want to write a biography. Thanks for highlighting Barbara's books. Her SCBWI artist statement is terrific. Can't wait to read and study these texts!! Right? Thanks for stopping by Marty! Wonderful post & #amwriting inspiration. Thank you! Welcome! Barbara's books are amazing. I love, love, love Barbara's work! She presented at a Highlights workshop I attended awhile ago, so I got to hear her talk about the research and writing of "The Streak." And when you start discussing her body of work in this post, it becomes apparent that she can hit the ball outta the park time after time! Plus, she's just a super nice person. Terrific post, Keila. Thanks! Thanks Jilanne. Lucky you, wish to meet her one day! The words, "The Heartbeat of a Story," inspired when I first heard Barb Rosenstock present at a writing conference. As I continue to write, I always remember to keep this important element in mind. Thank you, Keila, for an outstanding post. I would love to hear her speak. She is so good at finding the right focus of her story and sticking to that thread. Barb is a rock star! She's shared so many valuable insights. Book after book, she delivers. Such a talent! Great review. Such an amazing body of work. Awesome! Thanks! What timely post! I was struggling with a manuscript and rereading some of Barbara’s book gave me the spark I needed! Thank you. Welcome Julie! So happy it helped. Terrific insight into Barbara's works & the key components of successful PB biographies. Thanks Patricia. I just love her stories. So many wonderful mentor texts to study.